In the final installment of this highly regarded paranormal series, Kelley Armstrong’s Rituals is such a thrill and exciting read that readers will find themselves unable to stop until the last page has turned. When a new dark force disturbs the balance of the mundane and supernatural world, Olivia and her friends race against the clock to stop this darkness before they become victims themselves. With new secrets exposed and romantic tensions in the mix, this highly anticipated novel brings new excitement at every turn. What is this new dark presence? Who will Olivia choose: the Tylwyth Teg or the Cwn Annwn? Olivia Jones must make a choice. Caught between two rival supernatural forces, Liv was granted a brief period in which to make her decision. Now that time has run out. Whichever side she chooses, someone she loves will pay. Her lover, Ricky. Gabriel Walsh, the man she knows she cannot, must not love. Her parents, already trapped in prison. And now there is a new, terrifying power rising – one that doesn’t distinguish between good and evil intentions. It feeds on chaos and destroys without mercy. Unless Liv acts fast, no one will survive. In this gripping thriller, international bestselling author Kelley Armstrong brings the Cainsville series to a powerful, richly rewarding climax. This review WILL contain spoilers; please read at your own risk. Well, it’s come to an end…I’ve finally finished Kelley Armstrong’s Cainsville series. Rituals concludes Olivia’s epic journey, giving us the satisfaction of finally understanding the point for the murders, all the different ordeals Olivia’s faced, and the feud between the Tylwyth Teg and the Cwn Annwn. Or does she…well, she basically does. But those who are avid readers of Armstrong’s works know she never fully concludes a story because, let’s face it, where’s the fun in that? Even with this though, did I still feel satisfied with this ending? I have a love/hate relationship with the ending of a series; yes, I’m glad I finally reached the end, but there’s always that little bit of desire for more. Typically, I’m still happy with the ending of a good series. With Armstrong’s Cainsville series, I felt at a loss. I truly love Kelley Armstrong as a writer, yet this final book didn’t cut it for me. There are some elements missing that just didn’t give me that overall satisfaction to let the series go. Yes, it was a fun read and one I truly enjoyed. However, there’s definitely ways in which this could’ve improved. Right away, Rituals starts off full of action as Gabriel and Olivia rush to find the only person who can free her parents from prison. Unfortunately, fate has something else in store for our three comrades. Through a vision, Gabriel discovers a new foe: the unforgiven. An incredible darkness that shows no mercy towards humans or the supernatural, our main protagonists must find a way to stop this evil before all the people they love become engulfed into an endless and infinite fate of servitude. Flowing from one event to the next, Armstrong did an impeccable job at keeping the flow of the story on track. Honestly, I didn’t even realize when I was more than halfway done until I had to put the book down and discovered how much I read. From one thought to the next, this grand adventure runs so smoothly that time literally speeds by. Though the story moves incredibly well, the content was both phenomenal AND irritating. Finally putting so many missing pieces together, I finally began to comprehend why certain books strayed from the original story. Things started to make sense, bringing back the love I have for Armstrong’s works. Events and investigations from the previous books that “appear” to have no significance to the main story do begin to show a strong importance to the finale. It’s writing styles such as this that make me fond of reading series. However, the ending is what regrettably drew me to rank this as a 3 to 3.5 cups of tea. There just wasn’t this feeling of completion. 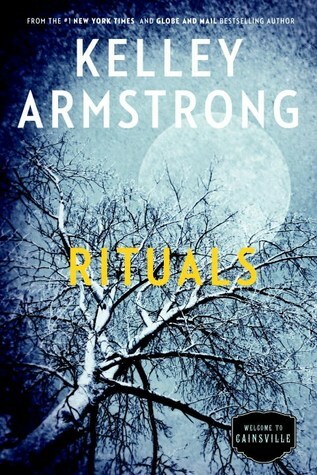 Armstrong leaves readers with unanswered questions, ones that I feel most readers will want to know desperately. These aren’t small things either, but MAJOR elements that connect to the main premise of the story. The ending is very cute and sweet, but I just needed more of a completion. What’s wonderful about this series is there are some characters who do a little growth and some that do a TREMENDOUS amount of growth; I find it make the characters more realistic, since some people need more personal development than others both in real life and fiction. Olivia started as a fairly strong but naïve individual. She grows intensely stronger through the series, yet more understanding about the world around her, especially how her actions may have consequences. Ricky learns how to take a more leadership role while also obtaining a very essential part of growing up, which is letting go. Gabriel has the ultimate amount of character growth in this series. From a pessimistic and distrustful individual, Gabriel becomes willing to lean on others and see the beauty in both love and friendship. Additionally, he learns how to speak his mind yet with carefulness…though he still has to work on that. The other characters in the story are spectacular, especially with Armstrong adding some new ones to spice things up in this already highly intense novel. Even the side characters grow, such as the Tylwyth Teg learning how secrets can cause more problems than good. If any of you are character oriented readers, I encourage you to pick this up simply for that. Even Ricky’s hound has her own character development…splendid! Cainsville is a wonderful edition to Kelley Armstrong’s repertoire. Is it her best? I personally don’t believe so. Nevertheless, this story is incredible with all the dark twists and thrilling scenes. In regards to Rituals, this book was still a joy to read even with some setbacks. The story flows magnificently and you can’t help but fall in love with the characters…especially the troublemakers such as MOST of the Tylwyth Teg. To those of you looking for a fast-paced suspenseful book with some love in the mix, I highly suggest adding the entire Cainsville series to your TBR list.